The contribution of human culture in moulding nature has come to be appreciated almost a generation later than nature in itself, and this even though it is the daily experience of every rambler or trekker on our continent, and even though scientists have indicated a likely impact on wildlife already by palaeolithic hunters, let alone an effect on climate and landscape alike already from the Neolithic agricultural revolution. Only with the European Commission’s Communication of July 2014 to the other European institutions, strongly promoted by then Commissioner Vassiliou and the whole Culture Directorate, as with the statements of the Council of Ministers under the Greek and Italian Presidencies, has the true significance of culture been given greater recognition. The word ENtopia denotes respect for the beauty of real places. This contrasts both with “utopia”, which by definition cannot exist, and the “dystopia” which characterizes all too many real places. 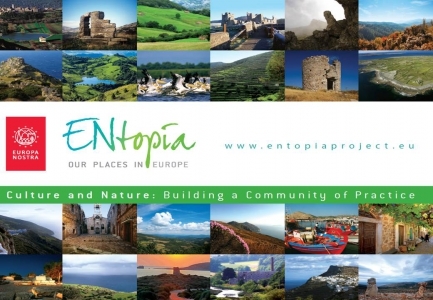 Europa Nostra’s ENtopia project began in 2010 under the direction of the Irish architect, Philip Geoghegan, and its website was completed in early 2015. The relationship between nature and culture is what Europa Nostra’s ENtopia project is about: it sets out to build a community of practice based neither on nature being distinct and separate from human influence nor on human beings draining nature of all value but the financial. Rather it posits a coordinating but never a dominant role for human beings in enhancing the value and meaning of the natural world through synergy and symbiosis. And it treasures existing examples of such synergy and symbiosis as models for a better future. Challenging, and varied, nominations have come in thus far from ten countries over Europe. Among them are the windswept Aran islands west of Ireland, the mild cultivated landscapes of Westmeath, coastal Port Carlisle in England, the bare hills of Cantabria, the forested landscape of southern Albania, a riverside wetland in Serbia, the island of Sikinos, one of the most precious gems of the Cyclades 70% of whose territory falls in a NATURA area, the 14th century mastic-producing villages of Chios, the Roman gold mines and the mining landscapes of Rosia Montana in Transylvania and the island of Skyros, whose recent history illustrates that an instrumental approach to nature can be almost as dangerous when it accompanies an attempt to mitigate climate change as when it carelessly contributes to the problem. Finally a monastery perched between a rock and a precipice in Amorgos serves as a parable of the challenges Europe faces in relation to nature, to culture and much else. When one lives on a precipice it is best to cling to the rock: Europe’s cultural and natural heritage may represent the rock contemporary Europe requires.